There's a Quilt Qwazy Queen in the house. Yes, it's true. I'm the only Queen in the house, so it must be me. But I'm not alone. At least I'm not the only Quilt Qwazy Queen out there in blog land. 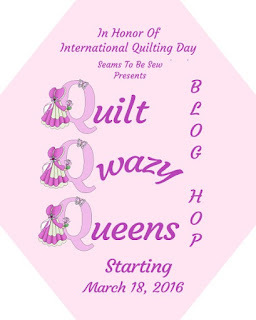 Which is why Marian (another Quilt Qwazy Queen) at Seams To Be Sew has organized another great blog hop. 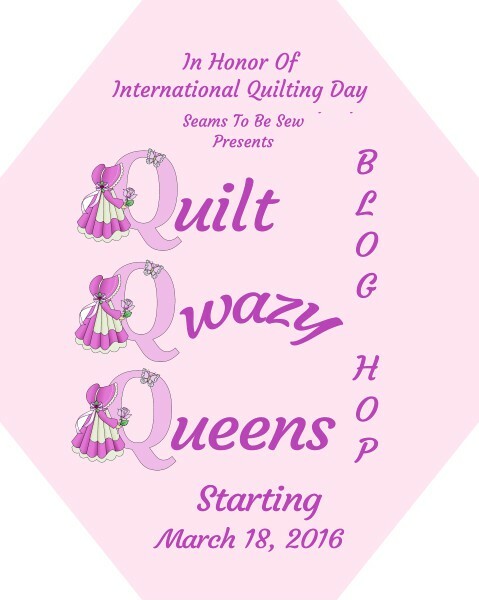 It's coming your way starting tomorrow and it's in honor of International Quilting Day (which is March 19th). I found this Sign and thought how appropriate it was. I ordered it so I hope it gets here before my posting day on the Quilt Qwazy Queens Blog Hop. As always, Marian has gone Quilt Qwazy with give aways too! You should see all the fabulous prizes. You really don't want to miss this one! You can see all the fabulous prizes here. My posting day isn't until the last day, but be sure to follow the schedule and check it out every day. Have a Quilt Qwazy Queen kind of day!